However, in the annals of the Congregation it holds a prominent place, due to its foundation in 1891. The Mill Hill Fathers, who were founded on the same day and in the same year as the Sisters of St Joseph, were all stationed in Maori Communities throughout the North Island. Matata was the Josephite Sisters’ first Maori foundation and the proud boast of children and parishioners, was that Mary MacKillop paid three visits there. The third one was of longer duration than the others, as the climate and the peace helped to relieve her rheumatism. For many years, the whole village was Catholic and only Catholics could stay. The Big Chief of the time stood at its entrance to vet all who came to the village. When the first three sisters appointed to Matata arrived from Australia after a harrowing journey by boat, canoe and finally, by coach, they must have been a bit dismayed to find a rambling big barn-like structure that was to be their home and school. The house was completely empty and there was not a person in sight to welcome them. The priest was away up country, but he arrived during the next morning. He gave the sisters a bag of maize and told them to grind it to make porridge! Though somewhat dismayed they set to and made a home out of this mainly unlined building, which sported a tin roof and rafters, along which the rats made their way. Life was pretty grim despite the fact that the Maori Community shared whatever they had with the sisters, but they were poor, too, and still recovering from the effect of the Land Wars. Despite all the difficulties and hardships, however, within a short time the sisters had a school up and running. 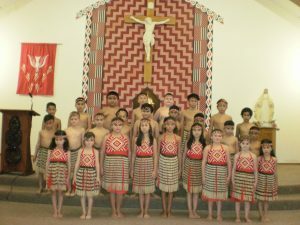 The children were taught all their prayers and catechism in Maori and the rest of the curriculum in English. The State School Inspectors in their visits, examinations and reports highly complimented the sisters. When Mary MacKillop visited the sisters in 1894, she, too, was able to compliment the sisters on the work they had achieved, all with a cheerful spirit, despite being hungry on many occasions. Mary, in her usual fashion, set about remedying this and as she moved on through the country she was able to gather butter, meat, etc, along with some hens and wire netting to enclose them. At last the sisters were able to enjoy some fresh meat and eggs to supplement their otherwise meagre diet. There were some memorable sisters who worked in Matata over the early hard years. Among them was Sister Basil O’Driscoll, a New Zealander who spent nearly all her teaching life in the Maori Schools. She loved being among the Maori People. Another was Sister Clement Walsh who spent many years in Matata. She had a way with medicines and used many of the native plants to help cure people who were sick. The Maori people had absolute faith in her and even, when they were able to visit a doctor, they would bring the prescription to Sister Clement to check it out. An often-forgotten fact is, that during the Great Flu after the First World War, the convent and school were used as a hospital and the sisters helped with the nursing. As a result of this work one of the sisters, Sister Lorenzo Scannell, caught the Flu and died on the 18th November 1918. She is buried in a beautifully kept grave behind the Church and on the hundredth anniversary of her death, November 2018, the school gathered for karakia (prayer) around her grave and each child placed a flower on the tomb. Until this day the sisters work and live in Matata and though no longer teaching in the school, have frequent and loving interaction with both staff and pupils. Mary MacKillop is revered by both staff and pupils and I am sure she smiles down upon them and continues to intercede for them. Image provided by Sr Margaret O’Neill rsj. Used with permission.